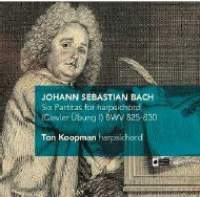 This recording of Bach’s first published keyboard collection was decades in the making, delayed by harpsichordist and conductor Ton Koopman’s monumental traversal of the complete cantatas and organ works, and his heroic endeavour to record the complete works of Buxtehude. As expected, the new recording reflects a commitment to scholarship and thorough reappraisal of the music in light of new research. Christoph Wolff writes the booklet-notes and gives an overview of the works, their genesis and distribution, and how new research has changed details of their execution. Koopman points out one detail that will have harpsichordists and pianists who confront these suites muttering with scepticism or perhaps chortling with pleasure: an odd transitional passage in the Sinfonia of the Second Partita, in which Koopman, with licence derived from Bach’s own markings in a score held by the Library of Congress, makes a much more dramatic passage, changing tempi for effect, rather than the awkward, sometimes pedantic approach most editions of the score seem to call for. Big effects are a hallmark of Koopman’s style. The playing throughout these suites is consistently extrovert and red-blooded, with frequent changes of registration on the robust Ruckers-style instrument by Willem Kroesbergen. In the opening flourish of the Sinfonia with the new transitional passage, Koopman creates a rich drama of dynamic contrasts, thin flutey sounds alternating with grander, thicker, coupled passages, in orchestral style. There’s rarely a sense of hesitation in Koopman’s playing, even when a certain tentativeness is called for. For example, in the Allemande of the Third Partita, Koopman seems to topple into the music rather than let it unfold in the gracious, flowing style more typical of the dance. The upside to all of this is dramatic interest and clarity. Lines are clearly demarcated, sometimes with a touch that adds so much staccato to the harpsichord’s naturally strong attack that the effect is clipped. Overall structure is clear and intelligent.